Mortadella di Bologna is so closely associated with the city of Bologna that Americans often use the terms “mortadella” and “bologna” interchangeably. There is something to be said for being in the right place at the right time. During our visit to Bologna in the Emilia Romagna region of Italy, we looked out our window and discovered we were almost sitting on top of MortadellaBo, a one-of-a-kind, four-day festival celebrating mortadella. Much of Piazza Maggiore, the public square in the historic center of the city, was swathed in pink with white dots. Booths were set up in the shape of a U on three sides of the square, facing San Petronius Basilica. There was something for everyone: Cooking demos and classes (using mortadella as an ingredient, of course), tastings, retail stalls, entertainment for children and families, finger foods, and a pink restaurant under a tent. Even the slicing machines were painted pink. Mortadella is a large, cylindrical, pink cured sausage made from crushed pork and spices based on recipes that date back to the Middle Ages. The sausage also has a distinctive aroma. However, what sets it apart from the bologna we eat in the U.S., is the meat’s visible fat in the form of white cubes. Under European law, Mortadella di Bologna (PGI) has a protected geographical indication, meaning that it can only be called mortadella if it is produced in Bologna, in other areas of Emilia Romagna, or in neighboring regions in Italy. In Italy, it is traditionally served in very thin slices (almost like proscuitto) but it is also served in cubes (with toothpicks) as an appetizer. It is often paired with bread (making a tasty sandwich with cheese), added to salads, or used as the stuffing for Bolognese tortellini. There were so many mortadella makers and retailers at the festival that I stopped to ask a young woman how a consumer would know how to choose one mortadella from the others. She left us with only one option, to taste several, because all the explanatory literature associated with the festival was written entirely in Italian. A festival celebrating a sausage: Why? Co-sponsored by many governmental and corporate entities, the MortadellaBo Festival is spearheaded by the Consorzio Mortadella, a group established in 2001 to “protect, promote and enhance Mortadella di Bologna IGP.” Some 31 companies belong to the consortium, producing 95 percent of the mortadella products consumed. We participated in one of many cooking classes on the program and learned from two excellent cooks how to make a pasta-free lasagna dish with sliced potatoes, fontina cheese and slices of mortadella. When I asked the young woman working next to me why she was there, she sheepishly told me that she was crazy about mortadella although she acknowledged that is is often viewed as a low-brow food choice by some (akin to a hot dog in America.) One reason for this is that it is made from some of the less desirable parts of the pig, in an effort to make sure that no part is wasted. Clearly, this event was intended to reverse the image problem of the lowly sausage. There were lectures by doctors and nutritionists debunking myths that it wasn’t healthy. They explained that one serving has no more calories that a serving of yogurt and fruit, and has less calories than a bowl of pasta. They went on to add that consumption of mortadella is part of a balanced diet. The authentic product is high in protein and contains no fillers or preservatives and tastes nothing like the bologna we eat at home. All the festival events were free. After mingling on the square with other festival attendees, we left not only with a renewed appreciation for mortadella but also a healthy respect for this unique festival that celebrates the famous Italian sausage. 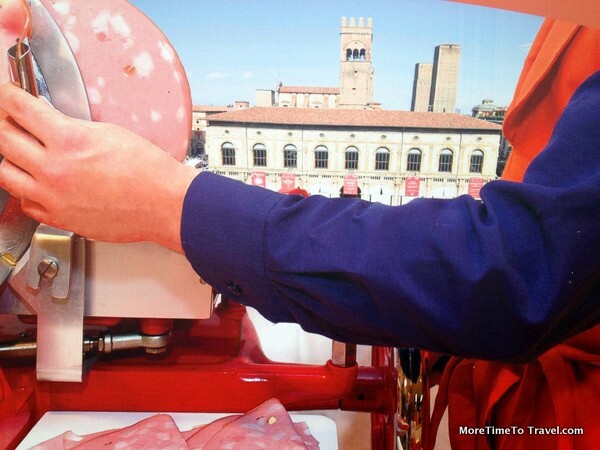 Read an excellent article on Mortadella di Bologna in Life in Italy. What are your feelings about mortadella? Do you love it or not? How Lunch Became A Pile of Bologna. Obviously, this isn’t the Oscar Mayer bologna I ate as a kid. I love the fact that there’s a MortadellaBo Festival and I would love to taste the various dishes it’s included in. This is awesome! A festival celebrating mortadella! We recently spent some time in Italy and at first I was afraid to try it…those white spots scared me (lol). But once I gave it a try, it was a hit! And now knowing that it has less calories than a bowl of pasta makes me feel even better about eating it…yum! Definitely one of those foods that tastes much better than it looks! Very interesting post. I’ve not tasted mortadella but would be willing to try it. It would be fun to attend the cooking classes about it. We lovely the conviviality and lively atmosphere! Now I know all I ever wanted to know about mortadela, a much more elegant name than baloney! We don’t have enough festivals like that in the US. I do like bologna, but I think I would rather not see the fat in it. As far as it being healthy?? Well, I’m sure it tastes good. Can you buy it here in the US? I know you can buy it in Italian delis in New York but I wonder if the quality is as good as it is in Italy. I’ve never tried it, but I definitely would! What fun! and I love the pink polkadot motif. How interesting! And so fortuitous that you happened to be there during a festival. Your photos, as always, are wonderful. I loved the pink and white polka-dot souvenirs! It seems that there is one festival after another on the Piazza Maggiore. We also were able to see the Saint Petronius Festival, which I hope to write about in another post. I worked in Italy a lot back in the 90s and we always thought it was funny that they had a huge Bolonga (Mortadella) at the highway service area right outside of Bolonga. Silly, I know, but stuck with me. Guess it made an impression! I can’t say that I’m a huge fan of mortadello but I am impressed with the energy that goes into pushing the product and the creative way they go about doing that – especially re the dress. In this case, they were preaching to the choir! A Mortadella festival in Bologna! Who knew? Paris Hilton would love all that pink; me, too. You know that Italians have a great sense of style! I love Italy, but have not been to Bologna. I’m a vegetarian so the mortadella wouldn’t be for me, but I’m sure there would be many other choices. That is a great photo of you and Bologna looks amazing. Bologna is more than Bologna and Mortadella! You would love the cheeses, fruits and vegetables, Michelle.